Opium, a nature-based substance derived from the opium poppy plant, produces pain-relieving effects in the body. Opium tincture also comes from the poppy plant. Opium’s overall effectiveness in treating conditions involving pain have brought about a wide spectrum of prescription pain medications. Opium tinctures contain small amounts of opium, so there’s really no use for it as a pain treatment. These small dosage amounts do however work well for treating gastrointestinal-related conditions. As with all prescription opiate drugs, opium tincture falls under the Schedule II class of controlled substances, which carry a high risk for abuse and addiction. Commonly used in herbal medicine practices, a tincture consists of an alcohol-based solution combined with one or more vegetable or chemical substances. The final product is an alcoholic extract of the added ingredient(s) with alcohol acting as a solvent. An opium tincture combines 10 milligrams of powered opium per one milliliter of alcohol solvent. On average, to qualify as a tincture, an extract must contain anywhere from 25 to 60 percent alcohol. While other materials can also work as solvents, alcohol’s chemical make-up mixes well with both acid- and alkaline-based substances. The alcohol content also has preservative properties. Tincture is used in some places as a treatment for digestive issues. According to Weber State University, natural opium contains approximately 10 percent morphine and five percent codeine. Weight-wise, opium tinctures contain around 10 percent powered opium, giving the final product a one percent morphine concentration. Opium, in general, carries natural pain-relieving properties. According to the University of Virginia School of Medicine, the body houses opioid cell receptors throughout the brain, peripheral nervous system and gastrointestinal tract. Opiate drugs work by altering certain cell-based chemical activities throughout these bodily systems. Opium tinctures are used as a treatment for diarrhea. In effect, tinctures capitalize on one of the more unpleasant side effects of taking opium-type drugs on a regular basis: constipation. Consequently, the “constipating” effects of a tincture work well at relieving persistent diarrhea symptoms. Since tincture preparations come in liquid form, it’s typically prescribed as an oral liquid medication. When monitored by a physician, these effects can also control diarrhea symptoms. The morphine ingredient contained in opium accounts for the drug’s analgesic effects; however, opium tinctures contain small doses of morphine so its analgesic effects are negligible. The morphine ingredient helps delay the time it takes food materials to leave the stomach and enter the small intestine. Tincture preparations can also help relieve conditions involving spasms and pain within the gastrointestinal tract. For help finding addiction treatment call 800-584-3274 toll free anytime. In cases of diarrhea, prescribed tincture amounts average around .6 millimeters taken four times daily for adults. As with any opiate-based drug, it’s important to follow prescription guidelines as this class of drug carries a high risk of abuse and addiction. In the event of a missed dose, it’s best to take it as soon as possible unless it’s almost time for the next dose, in which case it’s best to resume your normal dosing schedule. Unless told otherwise by a physician, it’s never a good idea to double up on doses. 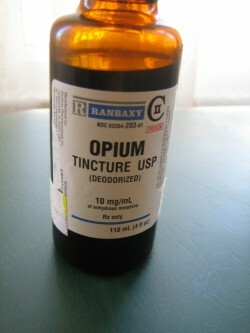 As with any other type of drug, opium tincture can bring on side effects depending on a person’s physiological make-up. Some side effects of tinctures may subside over time as the body adjusts to the effects of the drug. Any sign of overdose require immediate medical attention. In effect, any one of the above conditions may alter the way the body metabolizes opium tincture, which can weaken the effectiveness of the drug or enhance the drug’s effects. The effects of a tincture preparation can also make certain medical conditions worse. We can help you find treatment. Call 800-584-3274 toll free anytime. Certain other medications may interact and interfere with opium tincture’s intended effects. Opiate addiction treatment medications, such as buprenorphine, methadone and naltrexone will actually counteract a tincture’s effects and should not be taken at the same time. People currently on monoamine oxidase inhibitors or MAOIs should not take opium tincture. When combined with a tincture, MAOIs increase the risk of toxicity due to the tincture’s morphine ingredient. As with all opiate drugs, opium tincture can be habit-forming. Taking larger than prescribed doses or increasing dosage frequency carries a high potential for abuse as the brain and body can quickly develop a tolerance to the drug’s effects. Likewise, abruptly stopping the drug may bring on uncomfortable withdrawal effects so it’s always best to consult with your doctor beforehand.